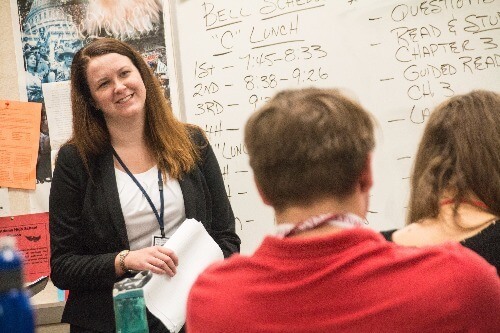 Notre Dame Law 3L Rachael Beattie teaches in September at John Adams High School in South Bend. // Photo by Alicia Sachau, Notre Dame Law School. As the bell rings for the end of the passing period at John Adams High School, students in Michael Szucs’ second-period government class pass forward their homework assignments — a one-paragraph observation of The Sentencing Project. Rachael Beattie, 3L, asked the class to visit the website last night and to jot down whatever struck them as interesting. Beattie is one of several Notre Dame Law students participating in Street Law, a program that started in 1972 in Washington, D.C., as a way to provide high school students with a basic legal background before graduation. 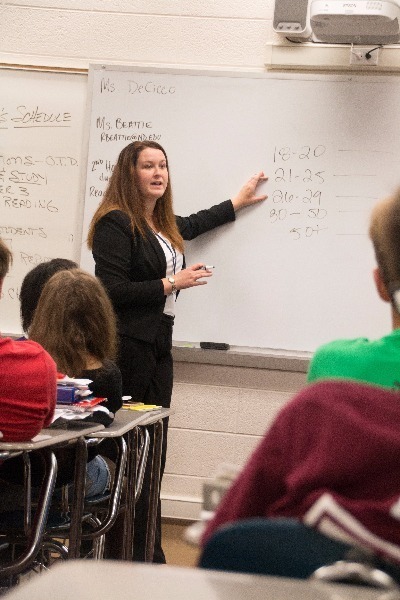 Since then, the program has spread out across the nation and morphed into a facet of government or history courses, giving students the opportunity to examine the state of U.S. law and discuss with their classmates and law students. For more than 15 years, Notre Dame Law Professor John Robinson has prepared hundreds of law students to teach Street Law in classrooms throughout the South Bend region. The class involves just a handful of meetings between Robinson and the law students. More time is spent going into local high school classrooms to teach. Back in the classroom at Adams High School, hands shoot up. Students want to talk about the disparities they find in sentencing based on race, age, gender, and location in the country. They don’t shy away from hard topics and opinions, and most have come to the vocal conclusion that there is bias in the justice system. Beattie teaches in Michael Szucs’ Government class at John Adams High School in South Bend. // Photo by Alicia Sachau, Notre Dame Law School. Beattie said before the class that she enjoys letting the class have the freedom to discuss topics at length. She acts as a moderator and discussion guide, asking students to elaborate or support their statements with facts. Beattie is unlike many of her other Law School classmates — she wants to teach, and not in a law school setting. She’s in the midst of applying for Ph.D. programs and isn’t sure if she wants to teach at the high school or undergraduate college level yet. Street Law gave her the opportunity to teach. Even if the majority of the law students in Street Law don’t end up in academia, Robinson said that perhaps the most important aspect of the class is teaching law students to talk to people who have no familiarity with the law. Szucs agreed. Szucs has participated in the Street Law class since former Notre Dame Law Professor Charles “Crutch” Crutchfield began the program locally in the 1970s. While the number of schools has changed over the years, Szucs has always kept Street Law in his Adams High School classroom. Robinson said he’d love to see the program grow into more schools. Originally published by Amanda Gray at law.nd.edu on October 11, 2017.